It is truly a Dragon Year for the Mega Publishing Group of Companies. Soon after celebrating the 25th Year Anniversary of Lifestyle Asia, they celebrated another milestone: Mega's 20th year as the Philippines' Best Fashion Magazine. Sari Yap had a vision when she founded Mega. Indeed, she proved to be a visionary--look just how far Mega has reached! 20 years of being on top of their trade and still the leading Fashion Magazine as of today! "Age cannot wither nor custom stale her infinite variety..."
It was a 2 fold celebration. It was also the Grande Finale of Mega's 10th Young Designers Competition. It featured a special capsule collection from 2011 Winner Russel Villafuerte and 2006 Finalist Veejay Floresca. The 6 Finalists were Mara Chua, Oz Go, Kirby Cruz, Robin Gundran, Ched Dalogaog and Renan Pacson. And the winner for 2012 Young Designer Competition is.....Renan Pacson! The judges were Meryll Yan, Avel Bacudio, Sari Yap, Raya Mananquil, Suki Salvador. The other winners were the fashionistas that graced the memorable affair! Dressed to the nines as always, Manila's A- lister did justice to an event that celebrates a magazine's dedication to style and elegance in fashion! 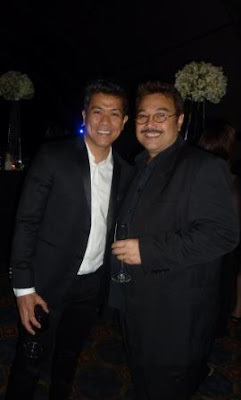 Congratulations to Sari Yap and the rest of the Mega staff who made the affair the success that it was! Young fashionista whose names I did not get but deserves to be featured because of their interesting gowns.